Leeroy New (b. 1986, General Santos City) is a Manila-based artist-designer whose practice overlaps and intersects with film, theater, product design, and fashion. He is a graduate of the Philippine High School for the Arts, where he majored in visual arts, and the University of the Philippines College of Fine Arts. He has received several citations for his work, including: the grand prize for sculpture in the 2005 Metrobank Art Awards; the 2009 Ateneo Art Awards, wherein he was awarded the La Trobe Residency Grant in Australia and the Artesan Gallery Residency Grant in Singapore; a nomination for the 2011 Signature Art Prize, Singapore; the 2012 Cultural Center of the Philippines 13 Artists Award and the 2014 Metrobank Foundation Award for Continuing Excellence and Service. Primarily a practicing artist, he has staged numerous exhibitions and public art projects, including the Psychopomp's Reef (2011) installation for Bonifacio Global City's Offsite public gallery and Chrysalis(2012), and a 40ft bamboo and rattan boat-like structure for the Himala sa Buhangin festival in Ilocos Norte (2012). 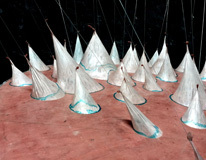 New has also been invited to participate in the 2008 Singapore Biennale and the 2009 Fukuoka Asian Art Triennale. New has recently ventured into product design and his works have been exhibited as part of the Design Philippines pavilion in the Salone Internazionale del Mobile in Milan last 2013 and the International Contemporary Furniture Fair in New York this 2014. His pieces have also been annually exhibited in Manila FAME since 2012. New also experiments with wearable art and has recently shown his brand of experimental fashion at the Istanbul Forum Fashion Week in 2013. He also designs sets, costumes, and puppets for film, theater, and dance productions and is a constant collaborator of the site-specific theater company, Sipat Lawin Ensemble. He was the recipient of the 2013 Philstage Gawad Buhay! award for Outstanding Costume Design for Tanghalang Pilipino's Ibalong.